Extremely rare and important example of 18th century 'Samovar-kitchen.' c. mid 1700s. 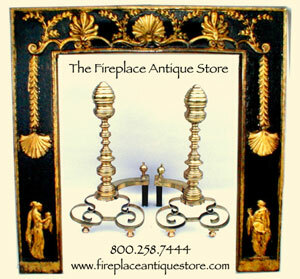 Entirely hand wrought with thick walled construction and fine craftsmanship. Hand hammered copper bowl lid removes to reveal triple cooking chamber - two for food one for hot liquids. Convertible folkloric brazier removes from chimney ash grate for use as a food warmer with serving the bowl. Scroll feet. Historical note: In the mid 18th Century in the Urals and Tula, Samovars were first introduced into Russia from Mongolia. This is an early and rare example of the Samovar-kitchen operated in the 1750's. 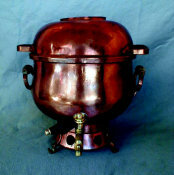 The Samovar-kitchen is a hand wrought prototype of Samovars to follow. Dimensions: H 15" W 14"
Tombak bronze, known for it's flame red-gold patina, was sought after and desired throughout the centuries for its dazzling color and unique resemblance to pure polished gold. 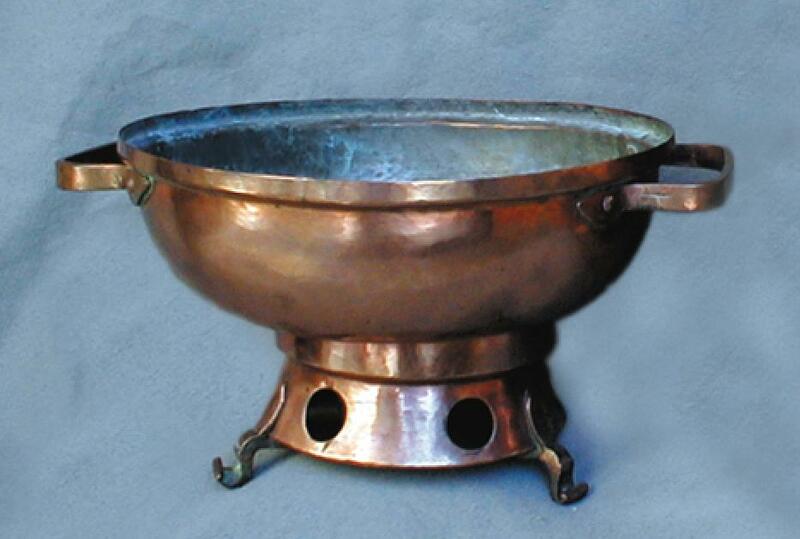 There are very few Tombak Bronze Samovars in existence today. Many were melted down during times of war to make armaments, and many were melted down to extract the Tombak to fashion it into jewelry and lavish presentation objects. The Samovar was first introduced to Russia from Mongolia in the mid 1700s. With the introduction of tea, Samovars became popular as a source of accessible hot water and for warmth from the bitter Russian winters. Most importantly, Samovars were the center of cultural life. The 18th and 19th centuries were times of great upheaval for the Jewish People. One can only imagine the conversations and events these Samovars have witnessed thoughout their histories in countless dwellings in Eastern and Central Europe and again on their long, treacherous voyage by sea to the "Goldene Medina". Of the highest quality and well maintained, most Antique Samovars can be used today and are ready to be enjoyed with your favorite Russian Tea recipe. Some Antique Samovars, because of their age and history, are recommended for decorative use only. Each Samovar in this Historic Collection is distinct in design and there is no comparison between the Samovars of present day manufacture and the ones made by the master craftsmen of Eastern Europe. As each Samovar reflects the magnificent artistry of the maker, so does each Samovar have a distinct personality - an inviting friendliness, cordiality and elegance. It is easy to imagine why these beautiful Samovars were the prize possessions of so many immigrant families. Russian Imperial Samovars were presented at exhibitions in Russia and abroad in the 18th and 19th centuries. The designers and makers were often awarded with medals, the reprints of which were later engraved or stamped on the Samovars and on Samovars of like design from the same maker or their heirs. Following the assassination of Alexander II, waves of pogroms swept Russia and the Ukraine. As a result, many families were desperate to make the voyage to America. Many Samovars are from the city of Tula, rich in copper and other natural ore deposits. The master craftsmen of Tula were also famous for gunsmithing and armament manufacture. During periods of war, Samovars were routinely melted down to be made into bullets and arms. In times of peace, the bullets, swords, cannons and guns were melted down and Samovars were made once again from the metals. 1903 marked the first Russian language publication of "The Protocols of the Elders," an antisemetic treatise forged by the Russian secret Police and based on writings directed against Napoleon in 1864. This Russian publication gave rise to a second barrage of violent pogroms starting in 1903 and lasted for years in Russia, the Ukraine, Kishinev, Gomel, Zitomer, and Odessa. During this time, at the turn of the century, Jewish Immigration to America increased. Many families could not afford passage to the New World for all and so sent a father, older brother or sister ahead to find work and make enough wages to send for other family members. Women and small children were usually the last to come, and sometimes families were separated for years. Many people were stuck in the Old Country and became refugees in the Russo-Japanese War of 1905, or World War I.
Ellis Island was the port of entry for most Immigrants, although many came through such places as the ports of Maryland and Texas.